I've seen some concern online over speculation that FFXV (relatively) lacks story compared to other Final Fantasy games. And it's true that, so far, I've encountered very few cut scenes — there's the intro, where Noctis takes leave of his father and heads out on his road trip; there was one elaborate scene involving the presumed villains of the piece toward the end of Chapter Two; and there have been a handful of short contextual bits upon reaching a plot destination (such as the introduction of Gladiolus's sister Iris at the hotel in Lestallum). Otherwise, though, this game couldn't be further from, say, Final Fantasy XIII and its stop-start procession of walking a short distance from point A to point B followed by a few minutes of forced dialogue. Chocobos make it a lot easier to avoid certain death, as represented by that gigantic horned thing over there. That doesn't mean the game lacks story, though. Plot, yeah — that's relatively sparse. But story is not just big events unfolding and mysterious bad guys in impossible armor chuckling about their mad schemes. Story is characterization and interaction and, in an interactive game, how you choose to experience those things. And FFXV has plenty of that. Most of the game's dialogue draws on the Grand Theft Auto style: Your party members banter while in transit, or while strolling around. In fact, I'd say FFXV has fewer fixed cutscenes than Grand Theft Auto V and focuses even more on telling story through diegetic conversations. 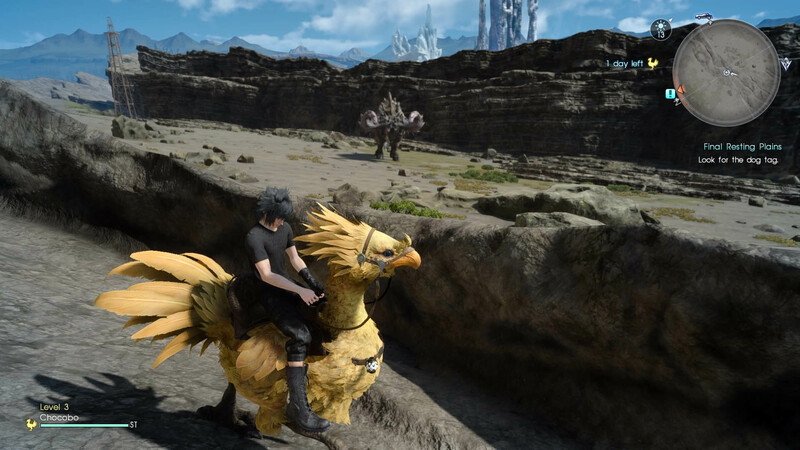 Typically this seems to happen while driving Regalia around, but I find that on the few occasions I've cut to the chase and used fast-travel shortcuts, those same conversations will happen while mounted on chocobos or even while walking around. As an example, a small earthquake shakes Lestrallum upon your arrival, and Noctis experiences a brief headache at the same time. For the next while, he'll complain about his pain from time to time, or else his companions will check in with him to see how he feels. There's definitely a big plot here, what with a heavily militarized empire conquering the protagonist's home, but ultimately FFXV feels more like Noctis's story than the story of the Crown City or the Empire. 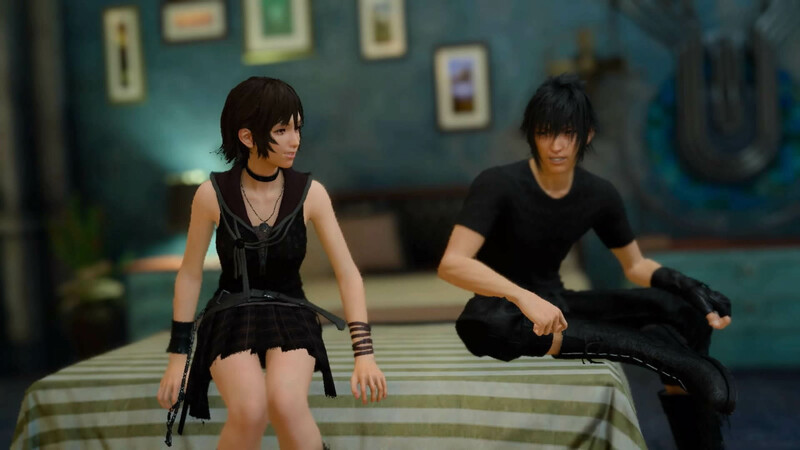 The focus of its narrative rests firmly in character-to-character dialogue, on Noctis's relationships, and on how other characters regard him both as a person and as royalty. It's different from the typical Final Fantasy fare, but the smaller, more humble approach really helps sell this game — which itself is different from the typical Final Fantasy fare as well. In fact, the most discordant parts of the plot have to do with the bad guys, who feel like holdovers from a different era: Final Fantasy XIII actors who wandered into the wrong production. You can buy CDs in-game to listen to on your road trips. Nothing lends quite so much majesty to a long drive by convertible across sprawling mountain roads like "Ahead On Our Way" from Final Fantasy V.
While your party sets out wearing their standard uniforms (yes, their individualized Shibuya fashion-template looks are in fact their royal guard uniforms), you immediately have a few customization options: You can remove their jackets for a more desert-appropriate look, or switch to casual wear (likewise, either with or without jackets). Although I haven't found shops that offer new outfits, I have to assume they exist. 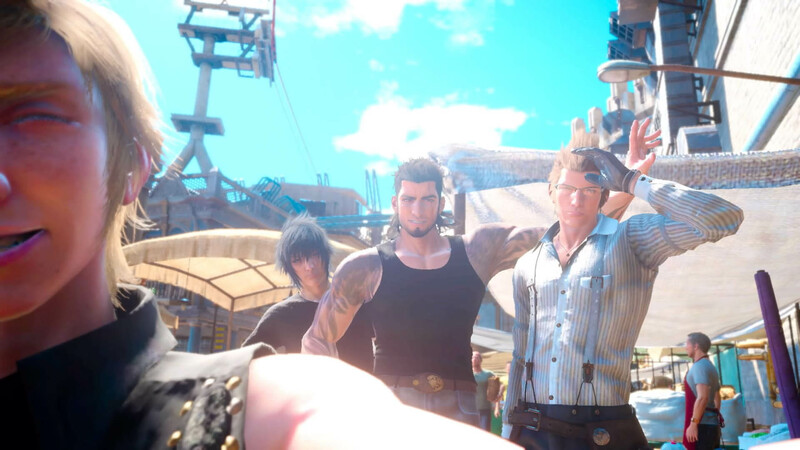 Prompto's selfie game is... well, it's certainly realistic. The Episode Duscae demo made Noctis's weapon preferences out to be quite confusing. He would seemingly swap between ghost weapons at random, slashing with a spirit sword before switching to a spectral halberd for a follow-up attack. The final game does away with that and simply provides you with four weapon selections tied to the D-pad: Press the appropriate direction and you will swap to that weapon for use until you switch around again. Each weapon has its own strengths and benefits, as well as its own chain combo timing. Noctis can effectively use any weapon he likes, whereas his companions specialize in one or two tools apiece. His default weapon is a short sword, which strikes a good balance between speed, precision, and strength. But you can also wield handguns to strike from a distance, a greatsword to deal greater damage, or even use machinery taken directly from Edgar's repertoire of tools in Final Fantasy VI — I mean, you start out with an auto-crossbow and a bio blaster — which burns magic points in return for fantastic support effects. The ghost weapons are still part of the game; they drive much of the plot in the early going, in fact. But once I began to collect them, I tended not to use them — they're fueled by Noctis's hit points, so you have to make a harsh tradeoff. On the other hand, the massive axe you collect as his second royal weapon hits about three times harder than any other weapon at that point of the game, so it's not like the tradeoff doesn't have its appeal. But again, these weapons no longer alternate at random; you select one of them and equip it to Noctis' D-pad-based weapon menu. I haven't come across a huge number of side quests so far in FFXV, and few of them have had any real narrative impact. But boy, are there plenty of hunts. And that's fine by me — one of the most addicting parts of Final Fantasy XII was hunting for unique monsters, and the process is no less appealing here. Many of the hunts I've undertaken so far have involved monsters from later in the game appearing at an earlier point than their normal random spawn zones. Others simply involve normal mobs with various buffs or unusual advantages. My hope is that the game contains more hunts like the Deadeye hunt seen in the Episode Duscae demo and reworked here as part of the optional (I think) chocobo sidequest: A huge, deliberately designed battle against an impressive foe. I imagine Deadeye will probably be more an exception than a rule, though. Prompto also lacks any respect for privacy. The downside to engaging in plenty of hunts as your work your way through the game is that you can very easily over-level yourself for the story portions. When it came time to fight the boss at the end of Chapter Two, for example, what presumably was meant to be an impressive and intimidating battle against a giant Magitek machine and an army of soldiers ended in short order because I had completed every available hunt to that point, and my team had combat stats about 50% above what the developers had likely intended for that point. The thing is, so far I've found no shortage of challenges regardless. Sure, the story portions have been a bit of a gimme to this point… but if you roam around in search of hunts, you'll always find something scaled to be just a bit beyond the means of your current team. There are about a dozen different places to pick up hunt assignments throughout Liede and Duscae, and they've been staggered to ensure that you can always find a tough challenge. Hunts always seem to provide the most interesting combat challenges, at least in the early going, introducing monsters with offensive and defensive powers that you won't find in the mundane mobs and forcing you to come to terms with your party's capabilities. It's always satisfying to barely scrape through a nasty fight with your team intact... and even more satisfying when they sag visibly after the fight ends and banter about how they're happy to even be alive. Tagged with PlayStation 4,	Previews,	Role Playing Games,	Single Player,	Square Enix,	Xbox One.